Most teams in professional sports (NFL, NBA, MLB) have a persistant identity that carries over from year to year. This identity can be defined by ownership (big budget/small budget), geographic location, coaching staff, local fan support, and many other factors. Similarly, college football and basketball can have the same coaching staffs for 10 or more years with consistant appeal for top recruits. From these identity characteristics, patterns of behavior can emerge that allow for predictability. Team trends is a mathematical accounting of these patterns and is often used by handicappers. 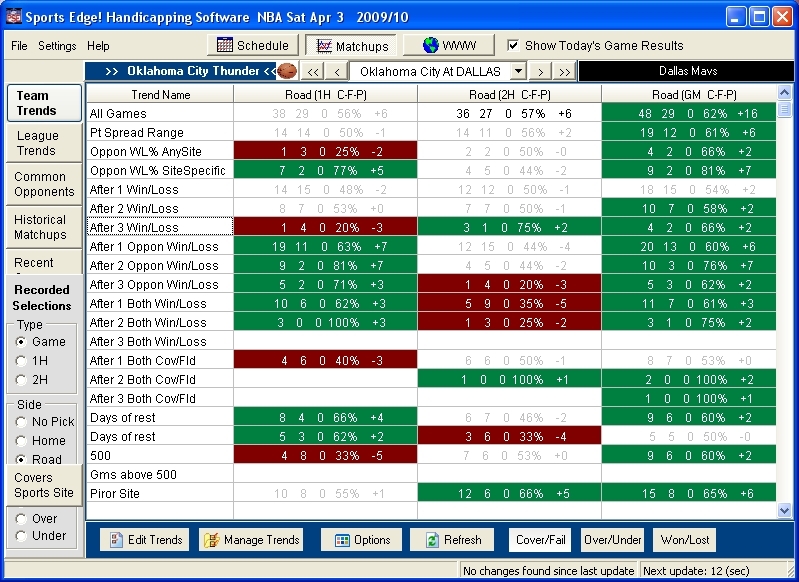 Within Sports Edge!, you have the ability to create many trends based on a combination of variables revolving around Team Schedule (off 3 consecutive Home games), Prior Game Results (e.g. Lost prior 2 games), and Performance Stats (e.g. current opponent WL% 50% to 70%). Trend results can be displayed based on 1st half, 2nd half, or game results and records displayed can indicate Straight Up (WL), Cover/Fail (ATS), and Over/Unders counts. Each trend record can be opened up to view the games that were included in the count.